Are you heading to university or TAFE? Need a little extra financial support? The Maldon & District Community Bank® Branch has two scholarships available in 2019, $2,000 and $1,000 scholarships, to support a young TAFE or undergraduate tertiary course student from the Maldon, Dunolly, Newstead and Mount Alexander district. Applications for the scholarship open in November annually. Applications are sought from young people starting or continuing a TAFE-based apprenticeship, a TAFE Certificate course, a diploma, advance diploma or university degree. Applicants must be aged 25 or under. To be eligible, you must live in the catchment area serviced by Maldon & District Community Bank® Branch, i.e. Maldon, Newstead, Mount Alexander Shire, Dunolly, Eddington, Moliagul, Bealiba and Tarnagulla. 2019 scholarship now open – click on links below for application form and guidelines. 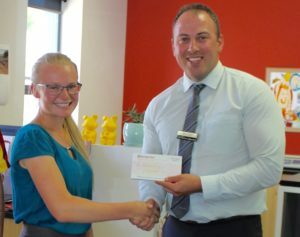 Congratulations to local student Jaclyn Holland for winning the inaugural Maldon & District Community Bank® tertiary scholarship in 2018. This scholarship is to help cover costs associated with tertiary education, such as course fees, rent, purchasing computers, books, equipment or other resources associated with your course. be an Australian citizen, permanent resident or on a permanent humanitarian visa. Courses ineligible for this scholarship include VETiS and Foundation level training and short courses. If you have any queries about this scholarship or application process please contact Executive Officer Karly Smith on executiveofficer@mdcb.com.au or 0478 435 110. For Community Bank news, and tips on improving your financial literacy, please join our mailing list. We will not share your details with 3rd parties.